We strive to feel connected. To belong. It’s not a surprise we try so hard to conform to societal standards. But do you ever wonder who is building the construct? We advertise belief and preference just by existing. We build the constructs with every choice we make. Chances are you have difficulty answering this question. It’s a big question! How many decisions do you make based on popularity? How many times do you follow recommendations blindly? We tend to do what makes us feel connected. Decide who you WANT to be. Realize what you do matters. Your choices create the standards people will conform to tomorrow. When you know who you want to be, choose your friends wisely because they influence who you are. This is an important concept because they help you become a role model for others to follow. 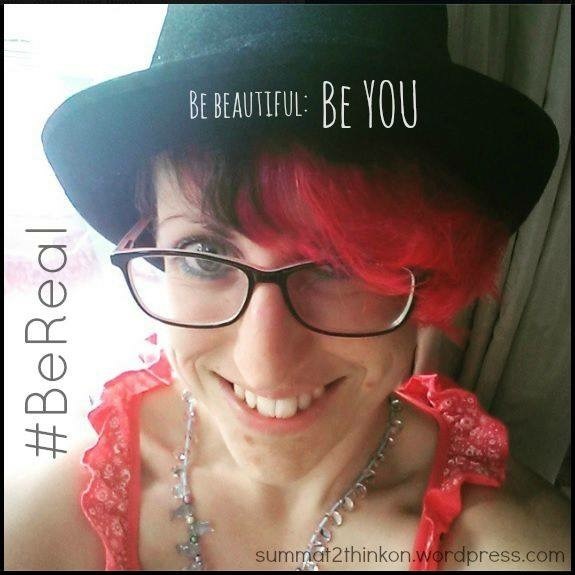 Llizzi is challenging harmful constructs and connecting with people who help her build better ones. When Hasty asked me to write about something I’m passionate about, I ran through all the causes I try to support or lend my input to, and no single one of them seemed strong enough to really tell you about – there’s not one mission or effort I care deeply enough about to really pin my colours to the mast about it. Then I realised; it’s PEOPLE. The thing I’m most passionate about is people. It might well be something to do with my inherent (and burgeoning) extrovertiness – I absolutely love being around/near/with people. I get energy from it, and I love interacting with people in real and online – those connections awesome, and those which deepen into friendships are wonderful and meaningful and beautiful. But further than that, I can’t help the edges of my mind sneaking away from me and beginning to encompass all the people who I don’t know in real, and somehow I begin to care about them, too. I care about orphans in Eastern Europe. I still wonder about the people in Nepal…Haiti…China…Burna…. I still wonder whether all the Nigerian schoolgirls were found yet and reunited with their families. I still worry that Princess Kate isn’t going to get the chance to just sit around and bond with her kid. And more, I worry about the huge huge numbers of people who struggle big, huge struggles, whose hurts are insufficient to be newsworthy, and who don’t have people around them to help. Everyone’s fighting something – we all hurt for something – and I hate when people hurt. And worse, when they hurt other people. I kind of feel that my mission in life is to love, because Love Wins, and to care for/about/ near as many people as I can, and to inspire others to care about other people, too…because if we all care for the people near to us, then eventually it will go full-circle, everyone will be looked after and loved, and no-one need be lonely or outcast or harmed, because we will all matter. It means trying to accept the messy, complex, damaged individual I am, and make the best of it, and know that others will also accept me, that further others will reject me, and that amidst those dichotomies I need to learn to find a place where neither of those things matters to the point that my self-esteem and self-worth lives or dies according to how others find me. And I need to make sure that my OWN view of myself isn’t one which harms me – I’m learning (slowly) to cut out the BS and embrace the good bits. I think they see an image they expect to be highly self-edited to attempt to convey a particular attitude. Hmmm…someone a bit fun and funky, and perhaps not a person to take themselves too seriously. I want them to see someone they think is awesome and beautiful and fit; someone they want to know more. I hope they don’t ever see what I see – someone desperately trying to fit into an image which might render them acceptable, and who is failing on every level, because no amount of pictures are sufficient to sate the monster ‘inadequacy’. You’d have to ask them! Maybe at how rude I can be sometimes (if I’m in the right (wrong?) mood). Or that I really don’t like chocolate that much. Perhaps…they might be surprised by how much I struggle with self-image. Which, ergh, sounds like humble-bragging now (so I’m feeling a bit wobbly about that) and it’s not meant to be…but I grew up being very belittled and bullied at home and everywhere else, for how I looked (amongst other things) and my experiences in life have since reinforced my status as someone who is ‘less than’ and ‘repulsive’…so I’ve come to own those, because they were so consistently pushed at me from all quarters. Trying to get through that mind-set and out into the sunshine is TOUGH. *I* am most surprised to find that I’ve begun to believe my own PR, so in spite of all the times I go on about being self-edited and that I’m not that nice of a person, I’m often surprised and disappointed when it transpires I’m actually not. I’ve had a few experiences lately where I’ve been shown a rather damning view of myself, and I kind of hope that I can somehow sort myself out so that I don’t turn into someone horrible. I least of all want to be that. Guess I’d kind of like to be as good as many people think I am. Or might be. Or could be one day, if I keep trying very hard. I think more people don’t than we want to admit… but I like your answer better. There’s that, too, and it can be upsetting to see who falls into those camps when we are faced with the inescapable truth, sometimes. Sunset, my lovely, thank you so so much for this campaign, this determination to heal people (or at least help them re-frame) and for letting me be part of it – even the part which pushes you beyond your comfort zone. I hope it reaches far and helps so many…I’ve already seen the impact of your inspiration and it’s amazing. I often don’t feel that awesome, and when I was writing this, I was very aware that I was showing some of the less awesome parts of my character. Thanks for liking me anyway. I think this is a rather lovely side-shoot from the #BeReal campaign – that we get to know people’s insides a bit better as they explain themselves in a very honest way. Beautiful post. I think we all have parts we would rather hide from the world. And when ever I read something like this from either Hasty or Lizzy, I wonder how odd it is that we do have so many things in common. It may just be that as a race we struggle with much of the same things and think that we are alone. (hugs) to you both. I think you’re absolutely spot on with your assessment – that we often struggle with many of the same things, but try to continue alone, without support, because for some reason we think we’re ‘supposed to’, or that sharing our challenges makes us weak. “It means trying to accept the messy, complex, damaged individual I am…” GUUURRRLLL. We’re ALL messy, complex and damaged 😀 Slobbered on, chewed up, puzzle pieces who just keep trying until we fit. And the puzzle changes almost daily, so yeah, it’s challenging, but at least we always know we fit somewhere! I’m learning that – I’m really, really learning that. And I’m kinda sad, because I assumed that somewhere there was someone who was just…alright! I may well have been deluding myself. SO WITH YOU on the puzzle changing daily! Owwww! I enjoyed the humor & the honesty – this is much needed! I already know most of what you’ve written here. I’m still baffled by the whole chocolate thing. You are probably one of the most caring people I know. That is a lovely quality and it’s probably the one thing about you (besides your most adorable quirkiness) that I notice most. We all have our ‘darker side’. We are all a little bent, maybe near broken. It’s what we do about it that determines our character. You are making strides for yourself and that is a big deal. I’m proud of you and I’m very happy I am able to call you ‘friend’. I’m branching out, my DA – I sometimes have a little dark chocolate these days, and I don’t hate it 🙂 Needs to be about 75% cocoa though. Thank you for thinking of me as caring. I do care…I care SO MUCH, and I’m always glad when it’s responded well to, rather than found cloying or overbearing…I’m a bit hopeless about taking people into my heart and then wishing I could fix them and sometimes getting a bit…irritating, I think. You and she. I am amazed by both of you. That’s all. Well…wow. Thank you. I’m amazed by her. Less amazed by me. But glad that somewhere in all the amazing, we amazed you. I hope it was good amazed. Thank you so much – I hope that this series brings such, such good things. I think it’s a brilliant initiative, and that everyone has real and beautiful in them, and we just need to somehow bring it out and make it acceptable. You are a gem. The insights you’ve gained from some really difficult times you’ve been through shine through your words. You know what it’s like to be hurt and instead of passing that hurt on, you’re turning it into compassion towards others. That’s what’s real.